Units 7 and 8 of the Rajasthan Atomic Power Project are officially under construction after a concrete-pouring ceremony, Nuclear Power Corporation of India Ltd (NPCIL) announced. 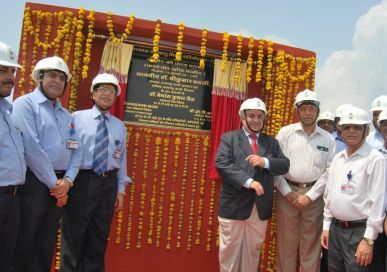 The event was attended by NPCIL chairman and managing director SK Jain and chairman of the Department of Atomic Energy, Srikumar Banerjee, who celebrated the progress towards the two 700 MWe indigenously designed pressurized heavy-water reactors (PHWRs). In August 2010, another ceremony marked the breaking of ground for the units. At that time, first concrete for the reactors had been planned for December 2010. RAPP units 7 and 8 are scheduled to begin commercial operation in June and December 2016, respectively, with their combined 1400 MWe capacity connected to the Northern Electricity Grid - and 700 MWe allocated to the state of Rajasthan. The estimated cost of constructing the two units is put at Rs 123.2 billion ($2.6 billion). In May 2010, Hindustan Construction Company (HCC) was awarded an Rs 8880 million ($188 million) contract to undertake main plant civil works of RAPP 7 and 8. HCC has constructed all six existing units at RAPP, which are also PHWRs of varying sizes, the first of which began operating in 1973 and the latest earlier this year. The Indian government gave the go-ahead for the construction of RAPP 7 and 8 in October 2009. At the same time, it approved the construction of two further 700 MWe PHWRs at Kakrapar in Gujarat state. First concrete for Kakrapar units 3 and 4 took place in November 2010 and March 2011, respectively. The Kakrapar site already hosts two 220 MWe PHWRs, which entered commercial operation in 1993 and 1995, respectively. The larger Kakrapar 3 and 4 are due to start operating in 2015. NPCIL's 700 MWe PHWR design is a scaled-up version of its 540 MWe design, two of which have been in operation at Tarapur 3 and 4 since 2005. Banerjee told The Hindu newspaper, "The 540 MW PHWR at Tarapur was built by NPCIL in a record time of four years and ten months." He added, "We will try to beat that record." According to NPCIL, there are currently 20 nuclear power reactors with a combined capacity of 4780 MWe in operation in the country, while a further seven units with a combined capacity of 5300 MWe are under construction. Once these reactors are completed, India's installed nuclear generating capacity will stand at some 10,080 MWe by 2017. The construction of additional units is planned, which will increase capacity to 20,000 MWe or more by 2020, the company said. In Russia, the reactor vessel for the first unit of the second phase of the Novovoronezh nuclear power plant has been delivered to the site after completing a journey of some 3800 kilometres from the manufacturer. The vessel for the VVER-1200 was made by OMZ Izhora in Saint Petersburg. Weighing 330 tonnes, measuring 11 metres in length and five metres in diameter, it was transported by ship along the River Neva, across Lake Ladoga and Lake Onega, through the Volga-Baltic Canal, along the River Volga and the River Don. On arrival at Novovoronezh City, the vessel was unloaded using a special crane and moved by self-propelled transporters to the construction site. Work started on Novovoronezh phase II - comprising two VVER-1200 units - in 2007. First concrete was poured for unit 1 of this in June 2008 and it is expected to be commissioned in 2012, with unit 2 following in 2013. The installation of the reactor vessel into unit 1 is scheduled to begin in December 2011.